Newly opened in 2012, Park Inn By Radisson Budapest offers classy air-conditioned rooms and a restaurant in the northern part of Budapest. WiFi is available for free. 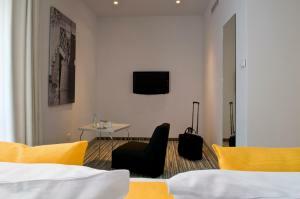 All rooms are decorated with vivid colours and equipped with a flat-screen TV and a safety box. 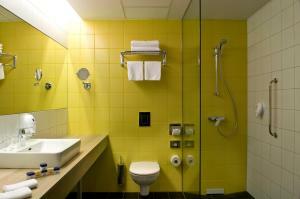 The private bathroom is fitted with a shower and a hairdryer, and in some of the rooms free toiletries are provided. The restaurant has been designed according to the latest trends and it serves Hungarian and international cuisine. The Park Inn By Radisson Budapest also comes with a bar offering coffees and tasty cocktails. The Duna Plaza Shopping Centre is 500 metres away as well as the Gyöngyösi utca M3 Metro Station, which takes you to the city centre within 15 minutes. The Liszt Ferenc International Airport is 22 km away. The Hajógyari Island, housing the famous Sziget Fesztival is 5 km from the premises. This room features air-conditioning. Please note that the bedding preference is subject to availability. Rate: € 60.00 ... € 119.99; select dates below to get current rates.